My review essay, ‘Waxworks and Wordless Women: the Jack the Ripper Museum’ was recently published in The Public Historian. The article is available on the TPH website, and a PDF is available to download here (see bibliographic information in text and below ). I initially had no intention of visiting the museum (as I wrote about for the National Council on Public History). However, in April 2016 I did go along to consider it in the broader context of women’s public history. The review essay also considers the interpretation techniques used at the museum, and discusses how such techniques work to silence the voices of women. 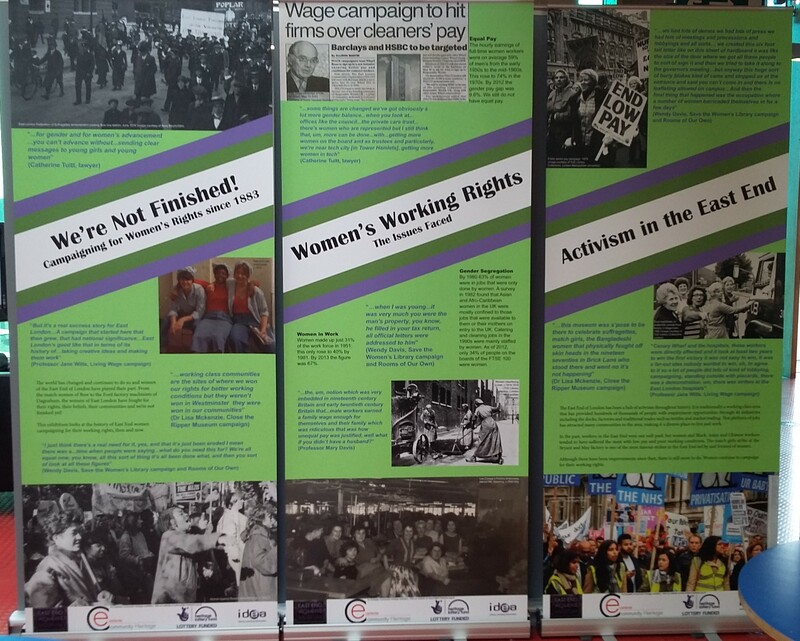 After visiting the Jack the Ripper Museum, I went straight to the East End Women’s Museum/Eastside Community Heritage display ‘We’re Not Finished!’, which was held at the Whitechapel Idea Store during March-April 2016. This display focused on the lives of women in the East End, and was in direct contrast to the portrayal of women at the Jack the Ripper Museum. I didn’t include images of either the museum or display in the article because I only have grainy images from my phone, but poor quality doesn’t matter so much on a blog. It packed in a lot for a small display, and covered a diverse range of women’s histories (from women’s perspectives!). You can find out about the display and the work of Eastside Community Heritage in this Ilford Recorder article. The East End Women’s Museum has since launched further projects that aim to put women at the centre of public histories of the East End. They have launched an online interactive map of women’s histories, which you can see and contribute to here. The Jack the Ripper Museum remains open, but there’s much to look forward to in women’s public history. Next year looks to be a particularly important one for women’s public history, with many institutions and groups marking the centenary of women over 30 gaining the vote. Here’s hoping that such projects and exhibitions will put women’s voices and women’s lives at the forefront of their own stories and histories. I’m so glad you liked the We’re Not Finished! exhibition. I was a trainee at Eastside Community Heritage and this was my project that I developed. It was amazing to work with the EEWM and to do even a little towards fighting back against the Jack the Ripper Museum.